It has been suggested that this article be merged with Indian Country. (Discuss) Proposed since January 2019. While Congress passed several Organic Acts that provided a path for statehood for much of the original Indian Country, Congress never passed an Organic Act for the Indian Territory. Indian Territory was never an organized incorporated territory of the United States. In general, tribes could not sell land to non-Indians (Johnson v. M'Intosh). Treaties with the tribes restricted entry of non-Indians into tribal areas; Indian tribes were largely self-governing, were suzerain nations, with established tribal governments and well established cultures. The region never had a formal government until after the American Civil War. At the time of the American Revolution, many Native American tribes had long-standing relationships with British who were loyal to the British Empire, but they had a less-developed relationship with the Empire's colonists-turned-rebels. After the defeat of the British, the Americans twice invaded the Ohio Country and were twice defeated. They finally defeated the Indian Western Confederacy at the Battle of Fallen Timbers in 1794 and imposed the Treaty of Greenville, which ceded most of what is now Ohio, part of present-day Indiana, and the lands that include present-day Chicago and Detroit, to the United States federal government. In 1803 the United States of America agreed to purchase France's claim to French Louisiana for a total of $15 million (less than 3 cents per acre). Which committed the US government to "the ultimate, but not to the immediate, admission" of the territory as multiple states, and "postponed its incorporation into the Union to the pleasure of Congress"
Before the 1871 Indian Appropriations Act, much of what was called Indian Territory was a large area in the central part of the United States whose boundaries were set by treaties between the US Government and various indigenous tribes. After 1871, the Federal Government dealt with Indian Tribes through statute; the 1871 Indian Appropriations Act also stated that. "[n]o Indian nation or tribe within the territory of the United States shall be acknowledged or recognized as an independent nation ...."
Agreement to legislation that Congress and the President "may deem necessary for the better administration of justice and the protection of the rights of person and property within the Indian territory." That a land patent, or "first-title deed" be issued as evidence of allotment, "issued by the President of the United States, and countersigned by the chief executive officer of the nation in which the land lies"
Another component of assimilation was homesteading. The Homestead Act of 1862, was signed into law by President Abraham Lincoln. The Act gave an applicant freehold title to an area called a "homestead" – typically 160 acres (65 hectares or one-fourth section) of undeveloped federal land. Within Indian Territory, as lands were removed from communal tribal ownership, a land patent (or first-title deed) was given to tribal members. The remaining land was sold on a first-come basis, typically by land run, with settlers also receiving a land patent type deed. For these now former Indian lands, the General Land Office distributed the sales funds to the various tribal entities, according to previously negotiated terms. The Wichita and Caddo both spoke Caddoan languages, as did the Kichai people, who were also indigenous to what is now Oklahoma and ultimately became part of the Wichita and Affiliated Tribes. The Wichita (and other tribes) signed a treaty of friendship with the US in 1835. The tribe's headquarters are in Anadarko, Oklahoma. 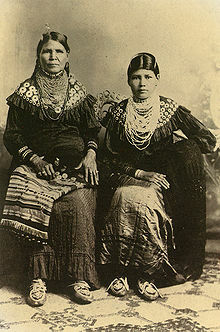 The Seminole People, originally from the present-day state of Florida, signed the Treaty of Payne's Landing in 1832, in response to the 1830 Indian Removal Act, that forced the tribes to move to Indian Territory in present-day Oklahoma. In October 1832 a delegation arrived in Indian Territory and conferred with the Creek Nation tribe that had already been removed to the area. 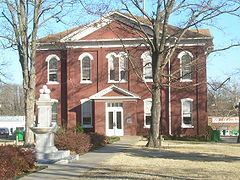 In 1833 an agreement was signed at Fort Gibson (on the Arkansas River just east of Muskogee, Oklahoma), accepting the area in the western part of the Creek Nation. However, the chiefs in Florida did not agree to the agreement. In spite of the disagreement, the treaty was ratified by the Senate in April 1934. The Illinois Potawatomi moved to present-day Nebraska and the Indiana Potawatomi moved to present-day Osawatomie, Kansas, an event known as the Potawatomi Trail of Death. The group settling in Nebraska adapted to the Plains Indian culture but the group settling in Kansas remained steadfast to their woodlands culture. 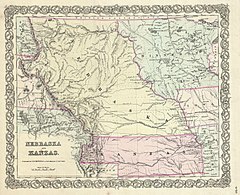 In 1867 part of the Kansas group negotiated the "Treaty of Washington with the Potawatomi" in which the Kansas Prairie Band Potawatomi Nation split and part of their land in Kansas was sold, purchasing land near present-day Shawnee, Oklahoma, they became the Citizen Potawatomi Nation. The Peoria tribe, native to southern Illinois, moved south to Missouri then Kansas, where they joined the Piankashaw, Kaskaskia, and Wea tribes. 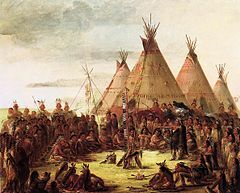 Under stipulations of the Omnibus Treaty of 1867, these confederated tribes and the Miami tribe left Kansas for Indian Territory on lands purchased from the Quapaw. 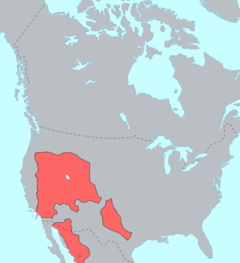 The Plains Apache or "Kiowa Apache", a branch of the Apache that lived in the upper Missouri River area and speak one of the Southern Athabaskan languages. 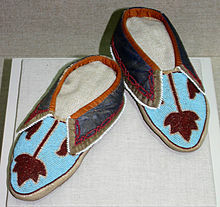 In the 18th century, the branch migrated south and adopted the lifestyle of the Kiowa. Tribal headquarters are in Anadarko, Oklahoma. 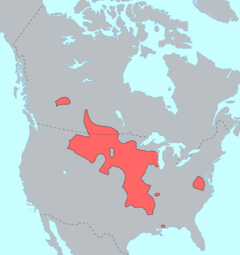 The Osage Nation speak one of the Siouan languages and originated in present-day Kentucky. As the Iroquois moved south, the Osage moved west. By the early 18th century the Osage had become the dominant power in the Oklahoma, Arkansas, Missouri and Kansas, controlling much of the land between the Red River and Missouri River. 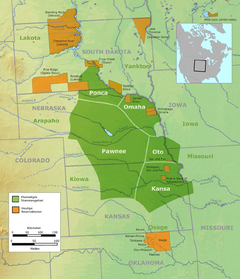 From 1818 to 1825 a series of treaties reduced the Osage lands to Independence, Kansas. 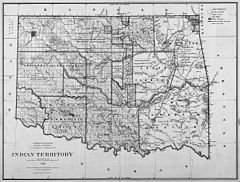 With the 1870 Drum Creek Treaty, the Kansas land was sold for $1.25 per acre and the Osage purchased 1,470,000 acres (5,900 km2) in Indian Territory's Cherokee Outlet, the current Osage County, Oklahoma. While the Osage did not escape the federal policy of allotting communal tribal land to individual tribal members, they negotiated to retain communal mineral rights to the reservation lands. These were later found to have crude oil, from which tribal members benefited from royalty revenues from oil development and production. Tribal headquarters are in Pawhuska, Oklahoma. No legislation regarding "matters pertaining to the legislative, judicial, or other organization, laws, or customs of the several tribes or nations, except as herein provided for"
A court or courts may be established in Indian Territory with such jurisdiction and organization as Congress may prescribe: "Provided that the same shall not interfere with the local judiciary of either of said nations." ^ Everett, Dianna. 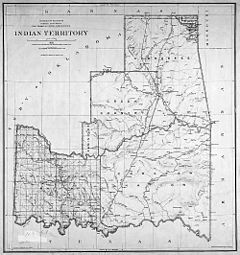 "Indian Territory Archived 2012-02-25 at the Wayback Machine," Encyclopedia of Oklahoma History and Culture, published by the Oklahoma Historical Society (accessed October 17, 2013). ^ Pennington, William D. Encyclopedia of Oklahoma History and Culture. "Reconstruction Treaties." Retrieved February 16, 2012. ^ "ACQUISITION OF THE PUBLIC DOMAIN, 1781–1867, Table 1.1" (PDF). Archived from the original (PDF) on July 23, 2011. Retrieved 2012-03-02. ^ a b "Downes v. Bidwell, 182 U.S. 244 (1901)". Retrieved 2012-03-02. ^ a b "Everett, Dianna. Encyclopedia of Oklahoma History and Culture. "Indian Territory."". Archived from the original on 2012-02-25. Retrieved 2012-02-15. ^ "United States v. Kagama, 118 U.S. 375 (1886), Filed May 10, 1886". Retrieved 2012-04-29. ^ "United States v. Kagama – 118 U.S. 375 (1886)". Retrieved 2012-04-29. ^ "Abrogation of treaties (25 USC Sec. 72) Codification R.S. Sec. 2080 derived from act July 5, 1862, ch. 135, Sec. 1, 12 Stat. 528". Archived from the original on March 17, 2012. Retrieved 2012-02-07. ^ a b "Treaty of Washington United States-Choctaw Nation-Chickasaw Nation, 14 Stat. 769, signed April 28, 1866". ^ "Treaty with the Kiowa and Comanche, 1867 (15 Stats., 581) (Medicine Lodge Treaty #1)". Archived from the original on 2011-11-26. ^ "Treaty with the Kiowa, Comanche, and Apache, 1867" (Medicine Lodge Treaty #2), (15 Stats. 589)". Retrieved 2012-02-29. ^ "Treaty with the Cheyenne and Arapaho, 1867" (Medicine Lodge Treaty #3), (15 Stats. 593)". Retrieved 2012-02-29. ^ "Enabling Act (Oklahoma) Public Law 234, HR 12797, Jun 16, 1906 (59th Congress, Session 1, chapter 3335". Retrieved 2012-01-30. ^ "TREATY WITH THE CADDO, July 1, 1835 (7 Stat., 470)". Retrieved 2012-03-01. ^ a b c "Treaty with the Comanche, Aionai, Anadarko, Caddo, etc., Wacoes, Keeches, Tonkaways, Wichetas, Towa-KarroesMay 15, 1846, (9 Stat., 844). 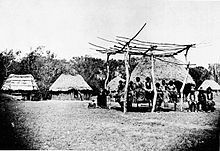 The treaty established the US as a protectorate of the tribes and established legal procedures between tribes and the US, Signed at Council Springs, Texas". Archived from the original on June 15, 2010. Retrieved 2012-03-01. ^ a b "TREATY WITH THE COMANCHE, ETC., Aug. 24, 1835. (7 Stat., 474) Treaty of Friendship between US and Comanche and Witchetaw nations, and Cherokee Muscogee, Choctaw, Osage, Seneca and Quapaw and established framework for legal system supervised by US. Signed on the eastern border of the Grand Prairie, near the Canadian river, in the Muscogee nation". Retrieved 2012-03-02. ^ Burt, Jesse; Ferguson, Bob (1973). "The Removal". Indians of the Southeast: Then and Now. Nashville and New York: Abingdon Press. pp. 170–173. ISBN 978-0-687-18793-5. ^ "1833 Treaty with the Chippewa, etc". Retrieved 2012-02-29. ^ "Treaty of Washington with the Potawatomi 1867". Retrieved 2012-02-29. ^ Roberson, Glen (2009). "Peoria". The Encyclopedia of Oklahoma History and Culture. Retrieved 21 December 2017. ^ "1817 Ponca Treaty with the US". Retrieved 2012-03-01. ^ "1858 Ponca Treaty with the US". Retrieved 2012-03-01. 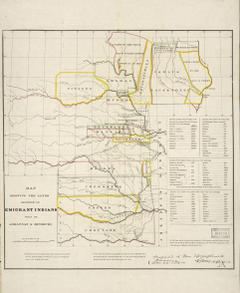 ^ "US-Sioux Treaty of 1868". Archived from the original on 2011-11-26. Retrieved 2011-11-04. ^ "May, John D. Otoe-Missouria. 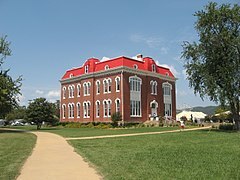 Oklahoma Historical Society's Encyclopedia of Oklahoma History & Culture". Archived from the original on 2010-07-20. Retrieved 2012-03-01. ^ "1957 Treaty with the Pawnee". Retrieved 2012-03-01. ^ "TREATY WITH THE KIOWA, ETC, May 26, 1837 (7 Stat. 533). Treaty of friendship between US and Kioway, Ka-ta-ka, and Ta-wa-ka-ro nations and Comanche, Witchetaw, Cherokee Muscogee, Choctaw, Osage, Seneca and Quapaw nations or tribes of Indians and provided for trade between Republics of Texas and Mexico, signed at Fort Gibson, Oklahoma". Retrieved 2012-03-02. ^ Self, Burl E. "Modoc". Encyclopedia of Oklahoma History and Culture. Oklahoma Historical Society. Retrieved 20 December 2017. ^ Westmoreland, Ingrid. "Nez Perce". Encyclopedia of Oklahoma History and Culture. Retrieved 20 December 2017. ^ "Organic Act, 1890, Oklahoma Historical Society's Encyclopedia of Oklahoma History". Retrieved 2012-01-30. Wikisource has the text of the 1921 Collier's Encyclopedia article Indian Territory. Hawes, J. W. (1879). "Indian Territory" . The American Cyclopædia. Peters, Gerhard; Woolley, John T. "Benjamin Harrison: "Proclamation 295 - Sioux Nation of Indians," February 10, 1890". The American Presidency Project. University of California - Santa Barbara. Retrieved 17 January 2016. Peters, Gerhard; Woolley, John T. "Benjamin Harrison: "Proclamation 298 - Extinguishing Indian Title to Certain Lands," October 23, 1890". The American Presidency Project. University of California - Santa Barbara. Retrieved 17 January 2016.